Furthering its commitment to advancing research & development (R&D) and innovation in the country, Intel India marked its 20th anniversary today with the inauguration of its latest state-of-the-art design house, SRR4, at its Bengaluru campus. It also announced key initiatives to promote innovation in the technology ecosystem and support inclusive participation of women in the industry. Built with an investment of approximately INR 1100 crore, the newest facility located at Intel’s 44-acre campus on Sarjapur Ring Road (SRR) in Bengaluru, has 620,000 sq. ft. of space including 100,000 sq. ft. of world-class lab infrastructure. Extending Intel’s R&D presence in India, it will house technologists who work on cutting-edge engineering across hardware and software. A smart and green building, SRR4 is the second building in India to be constructed with the innovative ‘One Storey High Technology,’ with each floor being built on the ground, then lifted and attached to the top of the building. This technology resulted in the reduction of scheduled construction time by up to 60% compared to traditional methods. The new building is equipped with IoT-based smart features, including smart lights and real-time occupancy management, as well as innovative energy harvesting tiles installed at the entrance of the building that generate and store energy as people walk into the building. In addition, it uses renewable energy sources like solar and fuel cells for power generation, which is expected to meet 40% of the building’s power demand and reduce CO2 emissions by 37%. 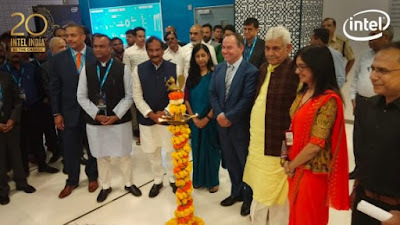 The state-of-the-art design facility was inaugurated by Manoj Sinha, Minister of State (IC) for Communications and Minister of State for Railways, Government of India, and Bob Swan, CFO and interim CEO of Intel Corporation in the presence of many other delegates from the government, industry and academia. “Over the last 20 years, Intel India has been relentlessly focusing on advancing technology development and innovation in the country by working closely with the vibrant ecosystem in India. Intel India plays a strategic role in Intel’s growth by making significant contributions to Intel’s technology and product portfolio in areas such as Cloud, Client, Graphics, Artificial Intelligence (AI), 5G and Advanced Driver Assistance System.,” said Nivruti Rai, Country Head of Intel India and VP of Data Center Group, Intel Corporation. “Our newest design facility, initiatives to promote the culture of innovation, Diversity & Inclusion, reinforce our long-term commitment towards technology advancement in the country. We are excited about the tremendous opportunities to innovate, collaborate and contribute towards a better India and a better world, specially the work we are doing in the area of urban and rural connectivity, AI and enabling the manufacturing ecosystem in India,” she added. The first recipients of these awards will be honored for work that has created significant impact to society, businesses, environment and livelihood over the last 20 years. The awards are part of Intel India’s ongoing efforts to inspire Indians to actively pursue technology and research, making India a hub for technology advancement, research and innovation. Intel India is part of Women Innovators, Social Leaders and Entrepreneurs (WISE), a collaborative initiative with key women leaders who offer leadership, mentoring, and development opportunities for women entrepreneurs and innovators in an effort to increase women’s participation in growing India’s economy. As part of the initiative, Intel India has developed the WISE-Readiness (WISE-R) framework that enterprises can use to accelerate inclusive participation of women in the industry. With a goal to have 500 enterprises WISE-Ready over the next 5 years, the framework includes key parameters like gender diversity representation and retention in the organization, number of women who have rejoined work after a career break, benefits for women in the workplace that promote work-life balance, number of women-led businesses in the supply chain, women-led startups being supported by them, and number of girls/women trained in STEM by enterprises.